Lyle: In the past 3 lessons you've been introduced to several different techniques to help you improvise over common jam situations. Another good technique to keep in mind is to structure and arrange the flow of your improvised solo. Let's say you had a 12 bar blues progression to solo over. You'll want to have a good start and have even a better finish to your improv. Listen to this short example of a 12 bar blues solo. Lyle: This is in the key of B minor. The solo starts on the root note of the progression, B. Notice how the flow of the solo slowly builds higher in pitch and excitement until it reaches the end and hits the last note, high B. Solo 1 peaks at the very last note, a high B note. This is a common and simple way to arrange an improvised solo. Start low and work your way up higher in pitch and excitement. Lyle: This next example is like solo 1 but instead of peaking the solo at the end, you'll peak a couple measures before, then run back down to where you started. Lyle: These two solos are great examples to help you model your own improvisations. Always build your solo by moving higher in pitch. You don't need to play fast licks, just move higher up the scale or neck position. Remember to either peak your solo just before the end or save the peak for the very end. Lyle: The next technique to help you improvise with is what I call the 50/50 technique. Place yourself as the listener of a good solo. If the soloist were playing lick after lick of familiar licks without much variation, as the listener, your attention level would drop. However, if the soloist played familiar licks mixed up with unfamiliar licks, your attention level would increase because what he was playing was unpredictable to your ears. Playing simple familiar licks (predictable licks) mixed up with unfamiliar licks (unpredictable licks) is what I call the 50/50 technique. Lyle: Simply put: Half the time, play predictable licks, the other half of the time play unpredictable licks. Listen to solo 3. You'll hear this technique in use. Lyle: Solo 4 used simple blues licks for the familiar parts, then arpeggios and sequenced scale licks for the unpredictable parts. If you're new to those licks, here's a breakdown of them. First, the Dmaj7 arpeggio made up of the 1-3-5-7 of the Dmaj scale. MarkW: Wow, that's cool! but why does Dmaj7 work over Bm jam track? Lyle: Bm is the relative minor of Dmaj. Lyle: Using arpeggios is a big help when improvising. When you play the notes of a chord one at a time, you're arpeggiating the chord. There are arpeggios for every chord. They're made up of the chord tones played one at a time. The Bm7 arpeggio is made from the root, b3rd, 5th, and b7th of the B minor scale, same tones that the Bm7 chord is made from. Lyle: Try using the Bm7 arpeggio patterns to improvise over the Bm7 chord during the progression. Lyle: The Em7 arpeggio is just like the Bm7 arpeggio but moved to a different place on the neck. Lyle: Use the Em7 arpeggio over the Em7 chord when improvising. Lyle: During the Gmaj7 chord you can use a Gmaj7 arpeggio, the 1-3-5-7 of the G major scale. Lyle: During the F#7alt. 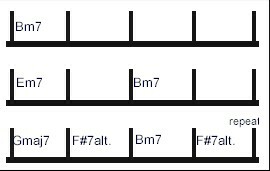 Chord (F#7 #9/#5) you can play root-b2-b3-3-#5-b7 arpeggio. Lyle: Notice that there are a couple of basic blues licks thrown in to give the solo a bit of predictability and the solo peaks out at the very end. Lyle: If you like working with arpeggios I suggest you check out the lessons titled Arpeggio Applications. MarkW: Can you explain that sequenced lick? Is it based on a chord or scale? Lyle: It looks as though it's the B harmonic minor scale. Lyle: Any time you're in a minor blues jam like this one, and the V chord is dominant, then you can use the harmonic minor scale during the dominant. Lyle: This minor blues jam is in Bm, the V chord is F#7, so you can switch to B harmonic minor scale during the F#7 chord. Lyle: Then back to the B natural minor scale for the rest of the jam. Lyle: Well, that's all for this lesson. Lyle: Lots of stuff for you to work on and think about. See you at the next lesson!